Creative Expressions from a fiber artist, beader, ribbon artist and embroiderer. Embroidery Month Give Away: And the winner IS! In honor of National Embroidery month I held a drawing for one person to receive my book the Embroidery Stitching Handy Pocket Guide and a set of my Embroidery Stencils. Congratulations to the winner who is: Calynn, and her blog is “a case of the crafties“. Thank you to everyone who participated, and Happy Stitching! In honor of National Embroidery month I am holding a drawing for one person to receive my book the Embroidery Stitching Handy Pocket Guide and a set of my Embroidery Stencils. The drawing begins today February 22, 2019 and ends February 28, 2019. 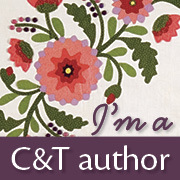 In order to be chosen, you must follow my blog, and like this page. If you are already following my blog, then you just need to like this page. I will be notified once this is done, and will put your name in the drawing. You can also leave a comment if you so wish, those are always welcome! Good Luck, and Happy Stitching! Many of you know that I love hearts! I love the shapes and all of the possibilities. This embroidered heart shape incorporates all of the traditional embroidery stitches that were included in my book Embroidered and Embellished. Many of you know that I love hearts! I love the shapes and all of the possibilities. These heart shaped brooches are from my class Scrumptious Hearts! Bits and pieces of cherished lace is collaged with silk fabric to form a beautiful heart shaped base for your floral design of ribbonwork flowers and silk ribbon embroidery. This is an excellent way to use up small amounts of this and that to form an heirloom brooch to be treasured. Many of you know that I love hearts! I love the shapes and all of the possibilities. This heart-shaped pillow was a project featured in my book Embroidered and Embellished. I really loved working the flowers and vines using variegated flosses, you never know how it will turn out! Many of you know that I love hearts! I love the shapes and all of the possibilities. This heart-shaped wall ornament from my class Shabby Chic Valentine embodies all things beautiful, lace, buttons and the simplicity of a project that can be completed in a day! Many of you know that I love hearts! I love the shapes and all of the possibilities. This is a version of my Phat Matt and Friends on-line class. This version has lots of patched hearts and a few heart shaped buttons, with fun colors, and she is filled with so much love! The stitches are simple ones: blanket, chain, lazy daisy, straight, back stitch, whipped, and French knot. Visit The Store on the Corner for creative supplies, patterns, classes, and inspiration! Beaded Embroidery Stitching Blog Tour: My Turn!